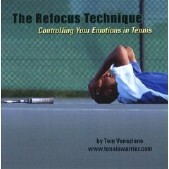 Tennis Server - Tennis Warrior - Using your two brains in match play! Using your two brains in match play! Are you a left brain or a right brain player? Which is better for match play? And how can you access the correct thinking? Below are some of the differences between left brain and right brain activity. Which one dominates your thinking in match play? Left Brain - logical, sequential, rational, analytical, objective, looks at parts. Right Brain - random, intuitive, holistic, synthesizing, subjective, looks at wholes. Both sides have their place but, as you can see, the right brain activity is more compatible with the spontaneous, automatic, and intuitive nature of match play and the Tennis Warrior System. If you are a left brain (analytical side) thinker you should learn to let go and access the right brain (intuitive side) as you begin your play. This IS important and one of the reasons why overdoing the technical skills can cause performance problems. Attempting to stay on the left brain side during match play will be counter productive and can cause you much frustration! Yet, this is the side that most players naturally access. You are about to return serve. You are thinking about hitting the ball early, keeping your knees bent, and watching the ball. Your opponent serves and you quickly go through all three of these techniques as you are hitting the ball. You make contact with the ball but your mind is so preoccupied and cluttered with techniques you are not sure what you are experiencing. The ball lands in the court but your stroke felt too rigid and confined. Everything seems to happen so quickly! On the other hand, to give yourself the greatest opportunity to experience the stroke and the feel of the moment you must learn to shut off your internal conscious analyses (left brain) and TRUST the intuitive (right brain). Again you are about to return serve. You are thinking about hitting the ball early and keeping your eye on the ball. But this time before your opponent serves you shut off this thought process and just experience what happens. Your opponent serves and you just let it happen! You may not play a perfect point but you notice you are more relaxed and experiencing the moment. The more you practice playing in this mode the more relaxed, instinctive and automatic you become. How do the pros experience their match play? Mayo Clinic researcher Debbie Crews can shed some light on the subject. These excerpts were found in an article written by David Kohn of the Baltimore Sun. The title of the article is "Study May Offer Clues about Choking under Pressure." 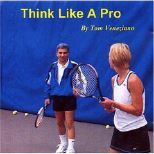 Although the main focus of the article was golf the principles certainly hold true to tennis. "In one study, Mayo Clinic researcher Debbie Crews used 41 electrodes per golfer to measure brain waves, muscle tension and heart rate. To raise the stakes, each golfer received a finger pri^ck from a needle every time they missed a putt." She found that the best putters had a distinctive brain wave pattern. In the seconds leading up to the putt, the left side of their brains - which controls logical and analytical processing - was active. Then, just before the subject putted, the left side quieted and the right side - which controls spatial orientation, timing and balance - became more active. "It's this beautiful balance between the two hemispheres," she says. Chokers exhibited a different pattern - their left lobes never shut down, "possibly obstructing the work of the right brain." Does your left brain never shut down in match play? If you are experiencing rigid and mechanical play and you are too tight under pressure, this could be the reason. You must learn to let go with your left brain mechanical side to access your right brain instinctive side. In other words, you must lose control to gain control!